Macmillan Cancer care was recently presented with a Cheque for £2300. 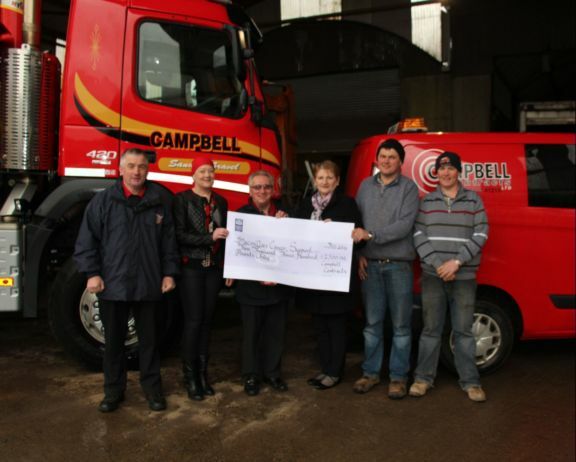 The money was jointly raised at the recent Campbell Contracts Rally Time Trial and by Staff at the South West Hospital Enniskillen. Left to Right Eamon McGarrity (Enniskillen Motorclub), Brenda Owens (SW Hospital), Willie Prescott (Macmillan Enniskillen Branch), Maire O’Hara (SW Hospital), Brendan Campbell and Damian Campbell.